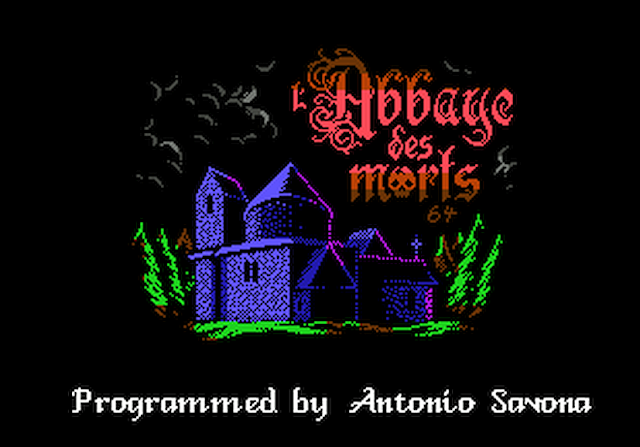 L’Abbaye des Morts (The Abbey of the Dead) 64, is the latest game from Antonio Savona and Double Sided Games. 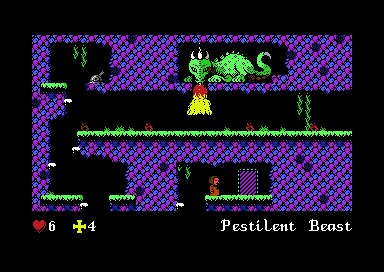 It’s actually a port of a ZX spectrum inspired mini game, written by Locamolito and released as freeware for Windows in 2010, It’s been ported to Linux, Mac OSX, Nintendo Wii / 3DS, SEGA Megadrive and in 2014 received a cassette version for ZX Spectrum. It’s also got a Dreamcast and now a C64 version on the way. The game was recently finished for C64, with a limited run of cartridge and floppy disk versions announced for pre-order from Double Sided Games. And a cassette version will be available later from Psytonik. So far we’ve only seen work in progress screenshots and videos from the game… but Double Sided Games were kind enough to send me a fully working version of the game to review and to play on my Twitch stream. So let’s start with the review! You are Jean Raymond, a Cathar monk from the Languedoc region of France. You’re being chased by Crusaders who are executing Cathar monks as heretics. 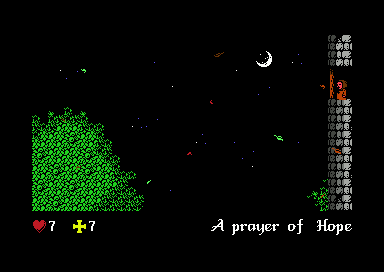 You start in a forest, and a number of Catholic knights are in hot pursuit. You see what looks like an abandoned church up ahead and try to seek refuge... You’re able to secure the door shut, at least temporarily from the Knights, but little do you know what evil lies within. Enemies are monochrome sprite representations of demons or small creatures with unique attack patterns. While the platforming takes the form of a series of static “flip” (non-scrolling) screens. 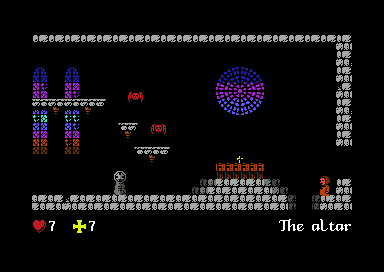 The original game draws obvious inspirations from early 8-bit platformers like Jet Set Willy and Manic Miner, and that feel has been brought across perfectly by Antonio Savona to the C64. Graphics are still largely monochrome but they have been redesigned from scratch by Saul Cross and look fantastic, taking the “ZX’y” feel of the original and fitting them perfectly in the C64 colour palette. Saul also produced the music, and there are 8 unique tracks which play throughout the game, with no hiccup from sound effects or gameplay. And the cassette version will get bonus music in the loader. Movement is slick and fluid, it plays and moves brilliantly, noticably much better than the Linux, Megadrive and HTML5 ports of the game. You can also tell a lot of effort has been made to keep the controls as tight as possible which is one of the most important factors in a C64 platform game. As always with Antonio Savona games there’ll be hidden surprises and features unique to the C64 version such as falling leaves animations and other surprises which you’ll have to play to find out! Although the game won’t take an awfully long time to complete, I see this being one that I’ll come back to frequently to try to speed run it. I think the difficulty is very well balanced considering it’s influenced by some pretty terrifyingly difficult games on the Spectrum. Enemies aren’t moving ridiculously fast for example, so negotiating attack patterns becomes a matter of skill rather than luck. Overall this is a brilliantly executed C64 production, which stays faithful to the Windows original, and will appeal to those who love the addictive puzzle platforming action of the 1980s. Antonio is becoming the consistently brilliant C64 programmer he promised not to be when he released P0 Snake as a “one off” game to finally finish something for C64. l’Abbaye des Morts 64 is available to pre-order on Cartridge and Floppy Disk right now from Double Sided Games and shipping is expected in January. Details of the digital download and Psytronik cassette version will follow.